The glorious sunflower, beautiful to look at and so easy to paint! One Stroke Painting allows you to blend, shade and highlight all at the same time, making it not only easy but the fastest way to paint. With just a few minutes of practice, anyone will be able to create a simple sunflower painting following my step by step instructions. I also include tips for embellishing your sunflower painting with dimensional paint and glitter, and the different looks you can get just by changing paint colors. This tutorial shows how to paint sunflowers on greeting cards. But you can also paint this simple design on canvas, glass, fabric, wood, furniture, serving trays, items from the thrift store, or any object you may have that needs a new look. For painting on metal or glass, please refer to my glass painting tutorial. These surfaces require different preparation, brushes and enamel paint. The finished sunflower painting coated with satin varnish and decorated with dimensional paint and glitter. Most of One Stroke Painting is done with a flat chiseled brush, like the two brushes on the left side of the photo. The chiseled edge makes clean points on leaves and flower petals. But for the sunflower painting, we also use a scruffy brush, third from the left. This is used for pouncing the center of the sunflower. It can also be used to paint clouds and fluffy animals like sheep, teddy bears and dogs. The brush on the right is what happens to flat brushes after they’ve been used to death. 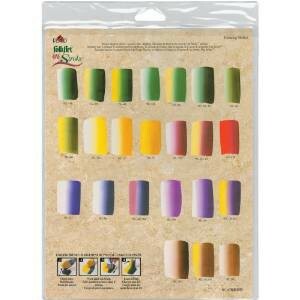 They’re no good for precision painting any more, but still useful for painting backgrounds. That’s what I used to paint the orange wash on the greeting card. I recommend you watch these two short videos before you start practicing doing the strokes on your own following the worksheets I’ve provided. See how Donna Dewberry, the Queen of One Stroke Painting, paints a sunflower. She demonstrates how to load the scruffy brush with paint, how to create the sunflower center, how to double load a flat brush, and how to paint the sunflower petals. Here’s an excellent demo of One Stroke Painting. There isn’t any speaking, just some background music which is a bit overwhelming, so I suggest turning the volume down or off. Instructions and the paint colors used are provided throughout the video in Italian. Get out some scratch paper and begin. Practice each individual element as illustrated in the sections beow. But remember one very important thing, One Stroke Painting is not about perfection. It’s about expressing yourself, letting go and having fun. Just spend a short amount of time getting the feel of it and then dive right in! Always paint the sunflower from the center out. The center makes up about half of the sunflower. To paint the sunflower center, I used a 1/2″ scruffy brush, Maple Syrup and Licorice paint. Load the brush by pouncing one half in Maple Syrup, and the other half in Licorice. Looking at the top left of the sunflower center worksheet, the center is pounced in a C shape going from right to left starting at the (X). Hold the brush so that Maple Syrup is on top, and that will create a little highlight. When you’re finished pouncing, the sunflower center should look like the one on the top right of the worksheet. To make a bud, pounce in a semicircle as shown on the middle of the worksheet (starting at A and ending at B). The petals would be added just to the bottom half of the bud, as shown on the lower right. To make the sunflower petals, I used a #8 flat brush, Lemon Custard and Yellow Ochre paint. Double load the brush and use a tiny dab of floating medium. Remember to keep the sunflower petals in proportion to the center. They’re roughly half the length of the center. 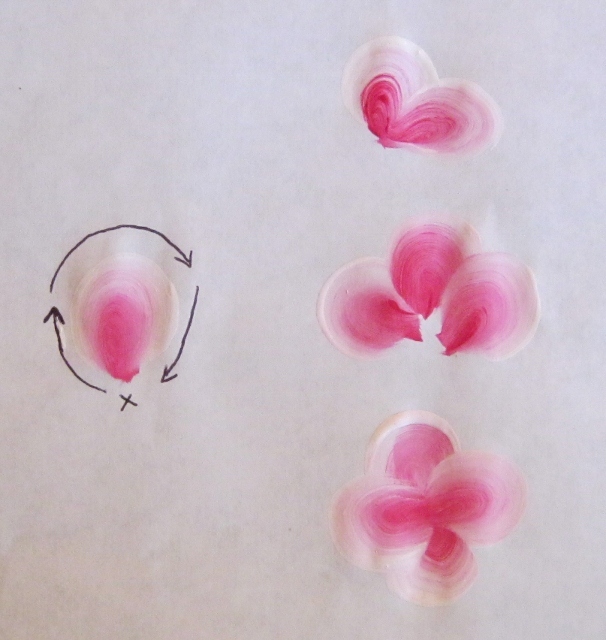 The petal worksheet shows how to make some different brush strokes. On the left side is a regular stroke, just like Donna demonstrated in the video. Begin at Start with the brush on the chiseled edge, press and pull, lifting up to finish the stroke back on the chiseled edge (marked End). You’ll see some of the petals going at different angles, like an S shape. You can also paint petals that look like they’re folding over the center of the sunflower. On the top middle and right of the petal worksheet I tried to show the two parts of a curved petal. It’s basically a C or U shape. The petal starts the same way but toward the middle you lift the brush and pull the other way. It’s a little difficult to explain; you’ll just have to try it. When you put the two sections together, the petals should look like the ones on the bottom middle and right of the worksheet. For the leaves I used a #12 flat brush, Grass Green and Jamaican Sea paints. You can use different colors if you like. Most of the time Donna uses Thicket with Wicker White or School Bus Yellow. Load the brush as demonstrated in Donna’s video. 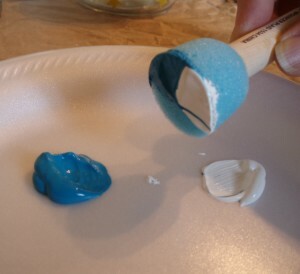 You’ll also need a little bit of floating medium to dip your brush into as you paint. This will keep the paint flowing and prevent dry edges in your strokes. Looking at the leaf worksheet above, the top left shows the two parts that make up an open leaf. Begin at point A with the brush on the chiseled edge, then press and wiggle the brush “like you’re scrubbing the floor” as Donna says. When you get to point B, you release pressure and stand the brush up on the chiseled edge. Flip your brush over and repeat for the other side. When you paint the strokes together, you’ll have a leaf like the one on the right side of the worksheet. 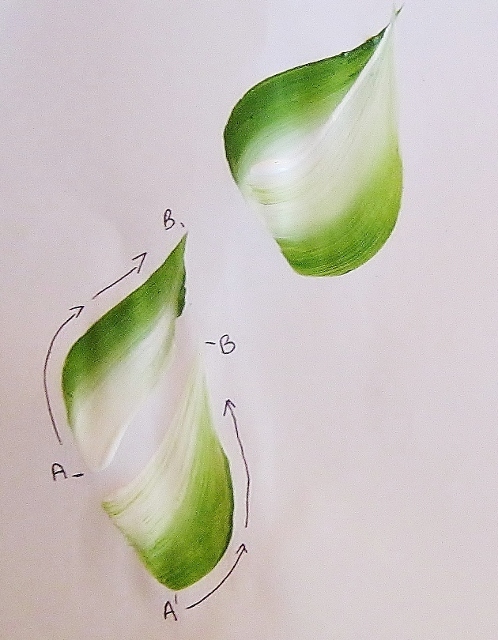 The bottom left of the leaf worksheet shows the two parts that make up a curled leaf. It’s done the same way except that you don’t flip the brush over to do the second half. It’s the same stroke done twice, one just below the other. While it’s not in the sunflower painting we’re doing today, I wanted to show you how to paint a sunflower viewed from the side. The difference here is that the center is pounced in an oval shape, as shown on the right side of the picture. The finished sunflower is on the left. Curved petals and a stem complete the illusion of a sunflower viewed from the side. You’ve done enough practice, now it’s time to get started! After it’s dried, the card tends to curl. My solution? Paint the inside also, let it dry then flatten it out more by curling the other way with your hands. Paint the sunflower center and immediately start adding the petals. Ideally you should be picking up a little of the dark paint. Notice that I’ve left a little space in between petals. Paint a second layer of petals in between the first layer. Because yellow paint does not have full coverage, you might want to go over the petals again when the paint is dry. Add a light highlight to center. Dip scruffy brush lightly into Yellow Custard paint, remove the excess by pouncing on a rag, then lightly pounce the center of the flower on top of the Maple Syrup paint. Seal the card with a coat of satin varnish. Embellish with dimensional paint (optional). Hold bottle at a 45 degree angle, squeeze and drag across the paper. 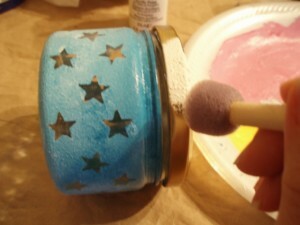 Dust with glitter if desired before paint dries. I used Wicker White on the petals with gold glitter, and Fresh Foliage on leaves with green glitter. The finished sunflower painting. Dots of iridescent glitter were added to the center. The same sunflower painting has a different look when you change the paint colors. Here’s the sunflower painting with a brown background. 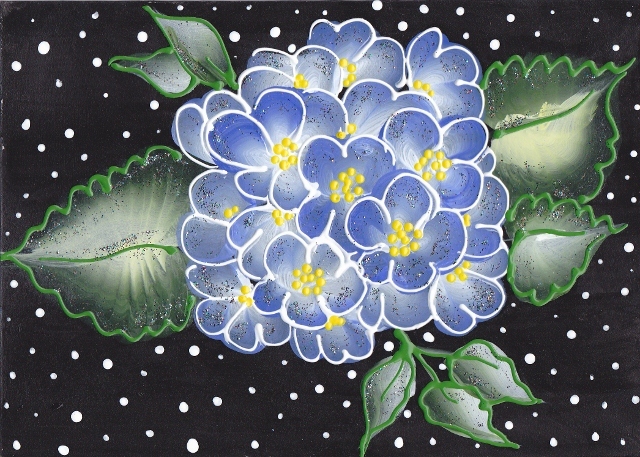 The center and petals are the same color, just outlined in white dimensional paint with clear glitter. The leaves were painted with Grass Green and School Bus Yellow, then outlined in black dimensional paint. Here’s a yellow sunflower painting with a lime green center. I went beyond basic One Stroke Painting and added shading. 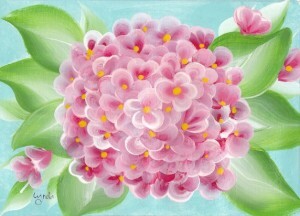 Impress your loved ones by giving them hand painted greeting cards. When you buy a pack of cards, you’re going to have at least ten. 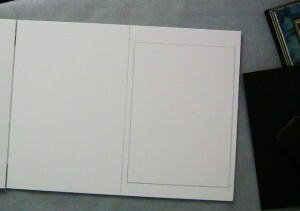 So here are a couple of tips to streamline the process of painting multiple cards. Tip 1: You can paint the backgrounds (and the insides) in advance. 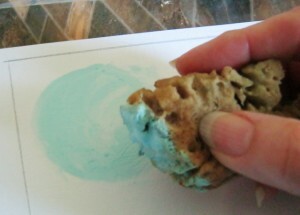 If you have any leftover paint from a project, make a wash with it and use it on the blank greeting cards. You can paint the envelope flaps too. Tip 2: If you have a design that you’re going to be repeating, line up all the cards and do each step at the same time, assembly line fashion. 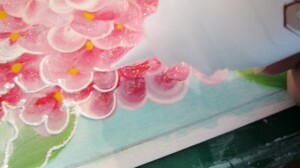 I’ll also show you how to embellish the hydrangea painting with dimensional paint and glitter. The One Stroke Painting technique can be used on any surface like wood, canvas, paper, metal or glass. You can even use it to beautify thrift shop treasures like old picture frames, boxes, mason jars, lamps and furniture. Metal and glass require different surface preparation, brushes and enamel paint which you can read about in my glass painting tutorial. Painting coated with satin varnish, before glitter and dimensional paint were added. One Stroke Painting is done by using two or more colors on a paintbrush to blend and shade with each stroke. 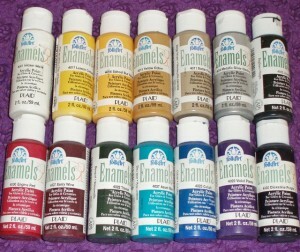 This eliminates a lot of steps that are used in traditional painting. The brushes are very important in creating the shapes. Most of the painting is done with flat brushes that have a chiseled edge. This allows you to paint shapes that start and end with a tapered line. The amount of pressure applied during the stroke is also very important. The more pressure, the wider the stroke. A typical stroke would start with the brush standing on the chiseled edge, then pressing down while moving the brush, and finishing up on the chiseled edge. 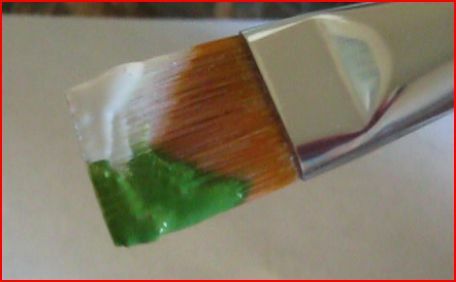 During painting, brushes will need to be cleaned periodically by wiping them off on a rag or cleaning them with water. Don’t ever let brushes dry with paint on them. When you’re finished painting, wash them with soap and water or use a brush cleaner like the one pictured. If you’re using a brush cleaner, work it into the bristles with your fingers or swirl the brush around in it. 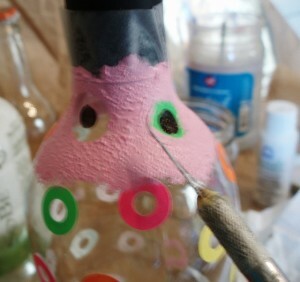 Drag brushes through a plastic scrubber to remove paint from the base. Rinse with water. Then squeeze out the excess water on a clean rag and flatten the bristles so that the edge is chiseled. Brushes will last a very long time if they’re cleaned properly. Brushes should be stored in a way that keeps the bristles from bending, either lying flat or standing in a container with the bristles facing up. This short video shows how to paint leaves and the same flower petals that are used for the hydrangea painting. The only difference is that the hydrangea petals are smaller. Also, the artist Ramesh Krish has an unusual way of loading the paint on the brush, but other than that, this is an excellent demonstration. Now that you’ve watched the videos, it’s time for you to start practicing the brush strokes used in this tutorial. So get out some scratch paper and begin by following the worksheet instructions below. This is the point where you may tense up and worry that you might not be able to do it right. But don’t stress! The strokes don’t have to be perfect. The two most common mistakes people make is not using enough paint and not using enough pressure. So make sure your brush is really loaded up with paint and reload frequently. As you practice you’ll get the feel for how much pressure you need to produce the strokes. See what effect you get when you angle the brush different ways. Just get the feel for it and then begin the hydrangea painting. 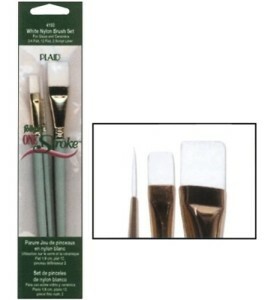 The 3/4″ flat brush double loaded with Grass Green and White acrylic paint for the leaves. Whatever color you lead with while making the stroke is the color that will be on the outside of the leaf. 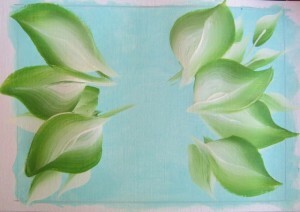 In my painting, the leaves are green on the outside and white in the middle. Two strokes are used to paint the leaves. The bottom left shows the two strokes individually, and the top right shows how they look painted together. To paint the leaves, begin the stroke at (A), move in the direction of the arrow while pressing down on the brush. 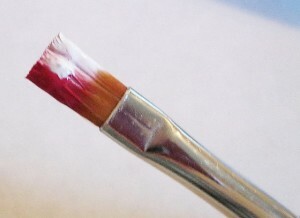 Use less pressure when you get to the end (B), then stand the brush up on the bristles to finish. Repeat for the other side of the leaf. The #8 flat brush double loaded with Engine Red and White acrylic paint for the hydrangea petals. The strokes are made with the white on the outside edge. Each flower petal is painted in one stroke. Begin and end at (X). Move the brush in the direction of the arrows. On the right you can see the flower petals connected. 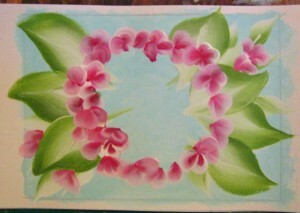 When making the painting, you can paint incomplete flowers as the flowers are going to be overlapping. When you’re finished practicing, take out your canvas and begin the painting by following the step by step instructions below. Yellow dots were put in the centers of the flowers. 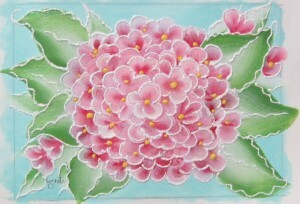 Finished hydrangea painting was sealed with a satin varnish to protect it and make the colors pop. Outlining with white dimensional paint. I did a small section then sprinkled crystal glitter over it, shook off the excess glitter and continued. The final painting with dimensional paint and glitter. Notice how the squiggly lines give the painting a funkier look. Here’s my hydrangea painting after it’s been framed. I recycled an old thrift shop frame that I picked up for $1.50 and painted it to coordinate with my painting. 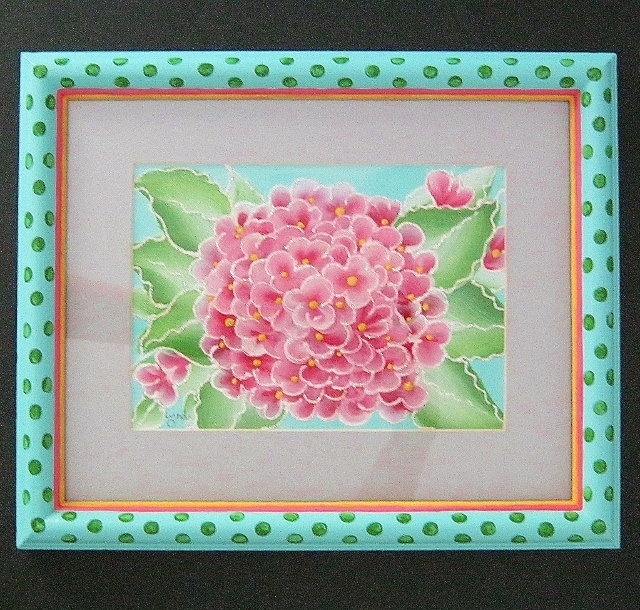 I just love the way it looks in that polka dot frame! You get a really different look by changing the colors. 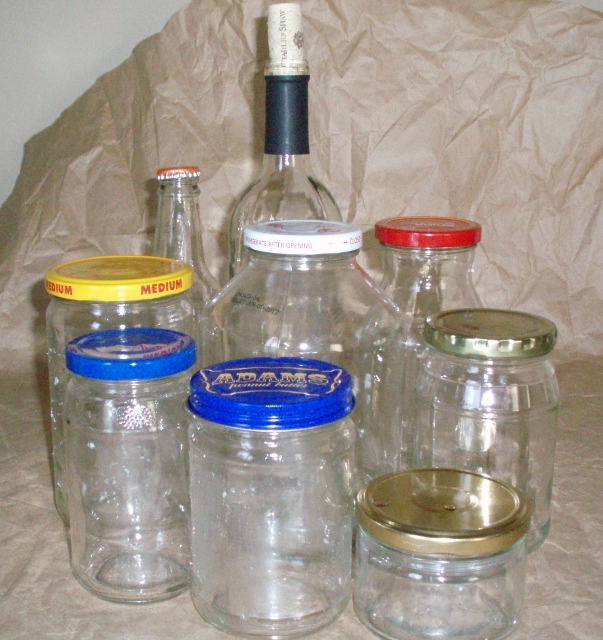 Want to save your empty glass jars from the recycling bin? 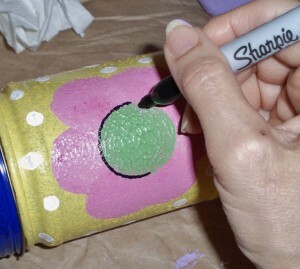 You can upcycle them into decorative containers by painting them with simple designs. 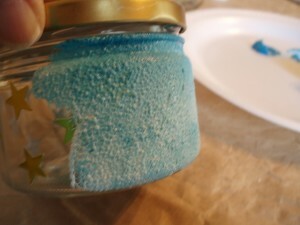 This tutorial shows easy techniques anybody can do using sponges, glass enamel paint and some office supplies. Painting on glass and other nonporous surfaces is not difficult. Although it seems a bit intimidating, all you need is the right paint and a little care in preparing the glass. 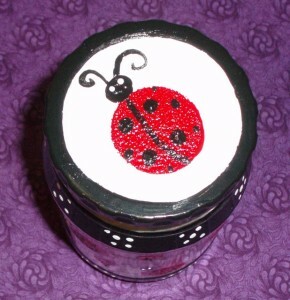 Handpainted glass jars make impressive gifts for any occasion. They can be used as vases, candleholders, canisters, drinking glasses and more. After mastering these simple techniques, you might want to take glass painting to the next level, and I’ll give you some suggestions for that. Your cupboards and refrigerator are filled with treasures! 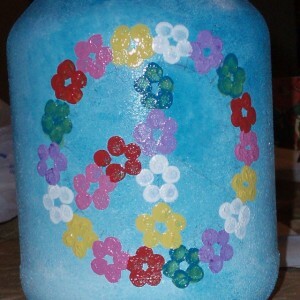 Glass bottles and jars will look different to you when you start thinking of them as canvas for your artwork. Each one is kind of interesting. Some are smooth. Some have texture. Some have embossed details or indentations. Often these features will influence your design. I’ve got quite the assortment of jars and bottles to work with here. You’ll also need a couple of small paintbrushes, disposable plate, rags, rubbing alcohol, cooking spray, an Xacto knife or other small knife and a Sharpie marker. Painting on glass requires the use of enamel paint. Acrylic paint will easily scrape off of glass, ruining all your work. I’ve used Plaid Enamel Glass Paint on many projects. No primer is needed. The paint is thick and creamy. It glides smoothly over glass. Many times you can get by with just one coat. 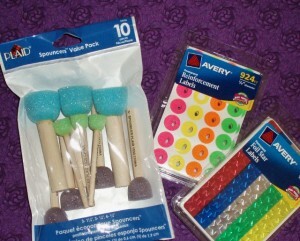 Brushes are easily cleaned with just soap and water. After the paint has dried, it has a nice shine, which means you don’t have to go over it with a gloss sealer. Plaid Enamel Glass Paint cures in 21 days. If you’re in a hurry, you can put glass into a cold oven, then turn it up to 350 degrees and bake for 30 minutes. When the paint is dried and cured, it can even be washed on the top shelf of the dishwasher. 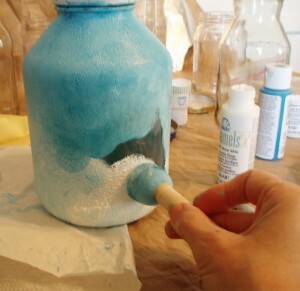 Before painting, jars must be clean and free from oil so that the paint will stick. 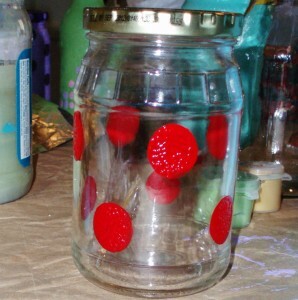 Jars must be washed with soap and warm water, then dried thoroughly. Make sure to remove the labels and any sticky residue that might be left behind. I’ve found the best way to get rid of it is with vegetable oil or cooking spray. Put some oil on the sticky bits and scrape it off with a knife. 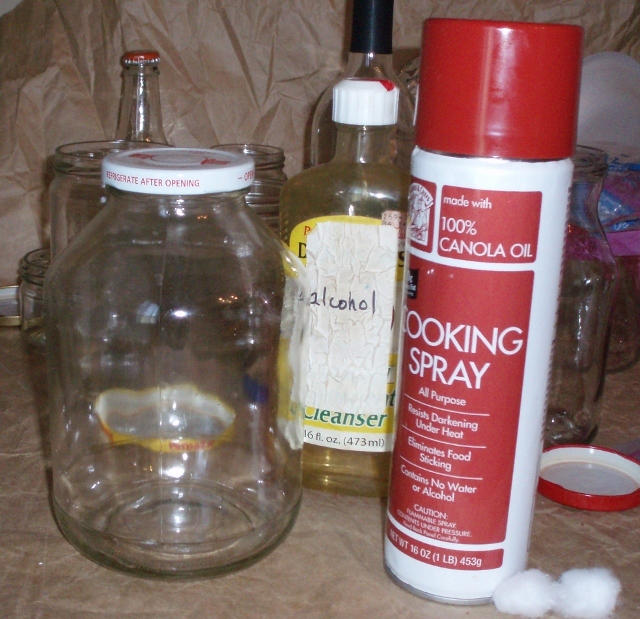 Then wipe off the oil and clean the outside of the jar with rubbing alcohol. When you’re cleaning the glass with alcohol, make sure to keep your skin from touching the glass so that the oils won’t transfer onto it. You can either wear gloves or hold the glass with a paper towel. 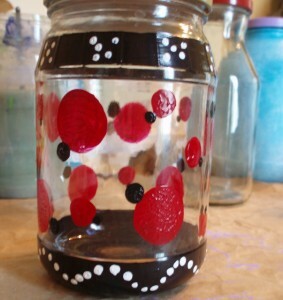 Polka dots are hot in fashion and also make cute designs on recycled glass jars. One easy way to do this is with round labels. All you do is stick the labels on the glass in any pattern you want. 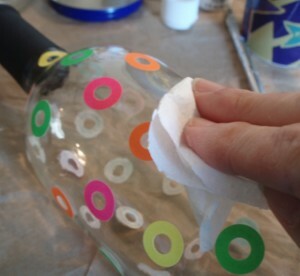 Paint the glass, remove the labels and you have instant polka dots. I’ve done the same thing with star stickers too. 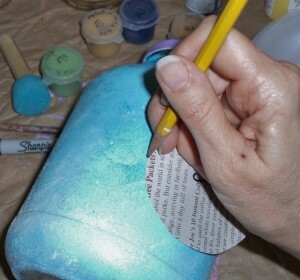 Before painting, dip the spouncer in water and squeeze out. Then pour some paint onto a disposable plate. Dip the spouncer into the paint and pounce a couple of times on the plate to remove some of the excess. Then sponge paint the glass. Sponge painting makes an interesting texture on the glass. Most of the time you’ll only need one coat of paint with this method. For the best result, remove the stickers while the paint is still wet. If you wait until the paint dries, when you remove the sticker some of the paint will peel off and ruin your design. 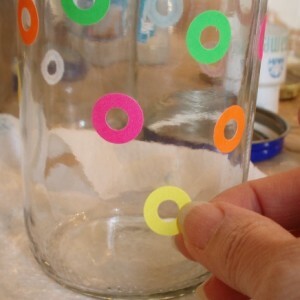 I paint a small section of the jar and then remove the labels immediately with an X-acto knife. Don’t worry if you get a little paint smudging. That can easily be scraped off after all the paint has dried. Note: Paint should not come in contact with food. The jars in this tutorial are painted on the outside so that they can be used to store food. 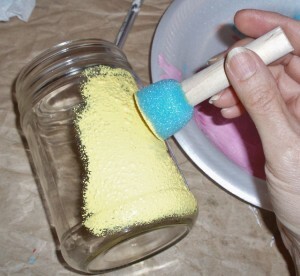 If you were going to use a jar as a drinking glass, make sure the paint starts about an inch below the top. As mentioned before, Plaid enamel paint is very durable once the paint has cured. There’s a difference between dried paint and cured paint. Plaid enamel paint dries fairly quickly but it won’t be cured until it has air dried for 21 days. You can speed up that process by putting your finished jars in a cold oven, so that they don’t shatter, then turning the oven temperature to 350 degrees. Bake the jars for 30 minutes, turn off the oven and let the jars stay in the oven until it has completely cooled off. At that point, the jars are ready to use and should be scratch-resistant. The jars can then be cleaned by hand washing them or putting them on the top rack of the dishwasher. 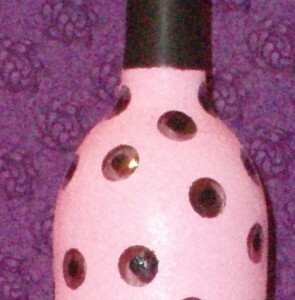 The black strip at the top of the bottle inspired the pink and black color scheme. 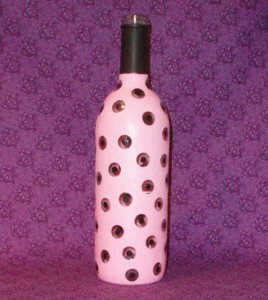 This bottle would make a nice bud vase or candle holder. Pink paint sponged carefully around labels. The inside dot is painted black. 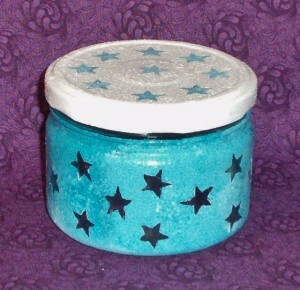 Blue jar with stars. This would make a good votive candle holder or candy dish. Sponging over the star stickers. They were removed before the paint dried. 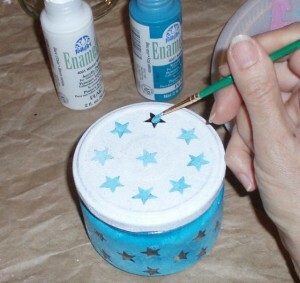 Adding star stickers to the lid. The lid was cleaned with alcohol first. 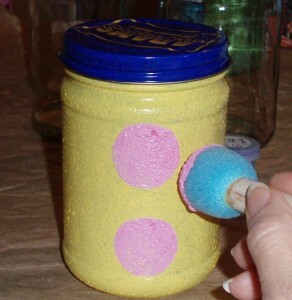 The pink and orange polka dots were put on this jar with a spouncer. The rest of the jar was left clear. 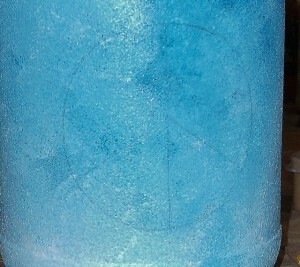 This soda bottle had an interesting embossed design. 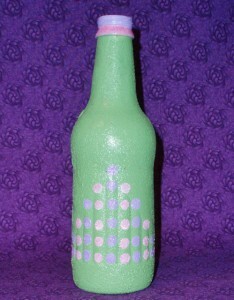 It was sponge painted green, then the design was highlighted with rows of pink and purple polka dots. 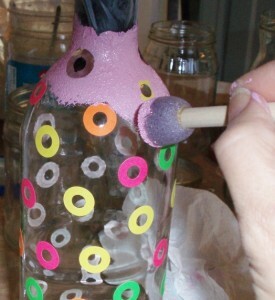 Pink and purple stripes were added to the top with small paint brush. This would make a nice vase. 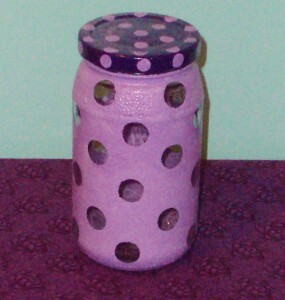 Round stickers were applied to this jar and it was sponge painted light purple. 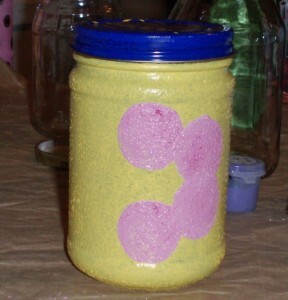 The lid was painted purple with light purple polka dots. 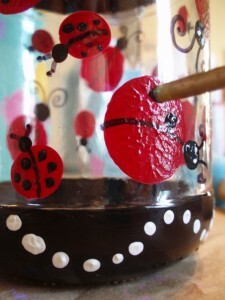 The small polka dots can be made with the eraser end of a pencil or the wooden end of a small spouncer. 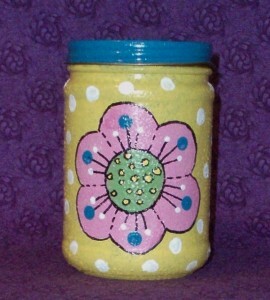 Yellow jar with white polka dots and a pink flower with polka dots and black marker details. 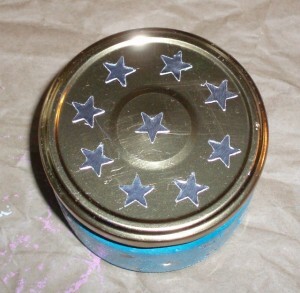 The lid is blue with yellow polka dots on top. Small black dots added to the red dots for the ladybug heads. 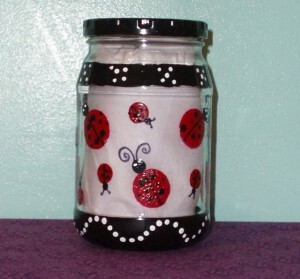 This jar has an embossed design at the top and bottom which were painted black with white polka dots. The white polka dots were made with the end of a small paintbrush. Antennae drawn in with black marker. White dots added to the ladybug heads. 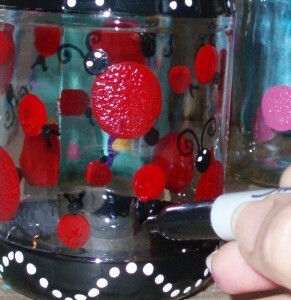 This glass jar design has layers upon layers of polka dots.The jar was painted turquoise. 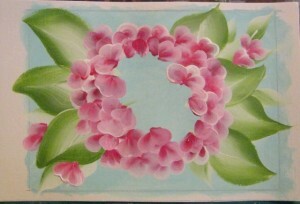 Flowers were painted with a large spouncer. A small spouncer was used for the center. The squiggly stems were added with a paintbrush. Then there are polka dots sprinkled everywhere. 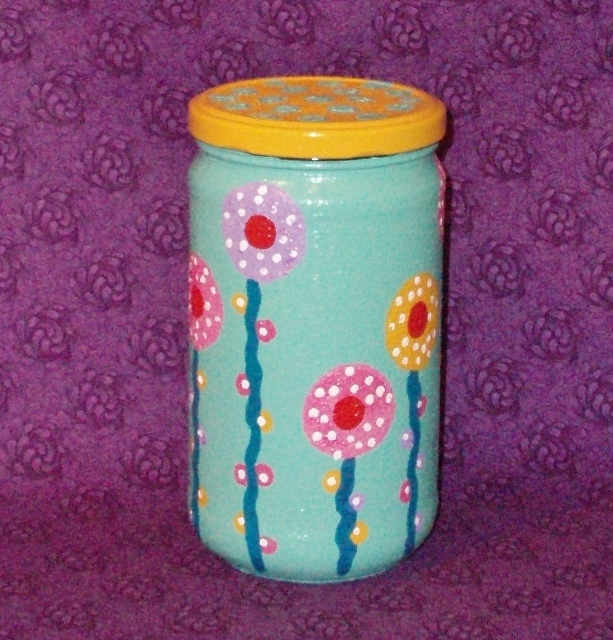 The lid is yellow with turquoise polka dots. 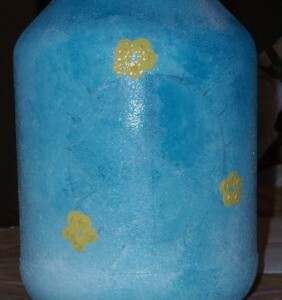 This old apple sauce jar was sponge painted with a sky background. 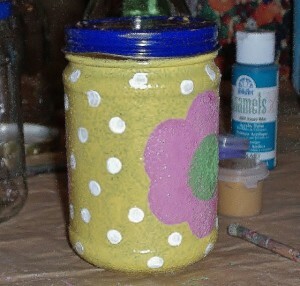 Polka dot flowers were added after the paint dried. Sponge painting the sky background. The blue is shaded with more white at the bottom than the top. Almost done with polka dot flowers. Centers were dotted in after the paint had dried for a few minutes. Remaining pencil lines were touched up with blue and white paint while the flowers were still wet. 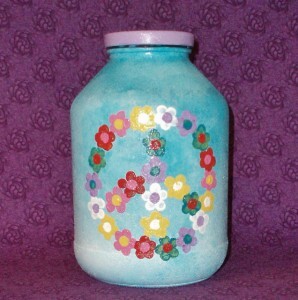 This painted peace sign jar makes a nice vase for these colorful flowers. 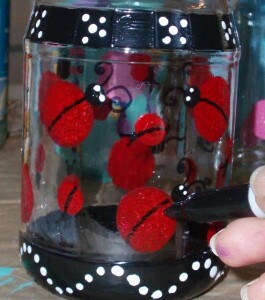 Adding embellishments to painted glass jars. 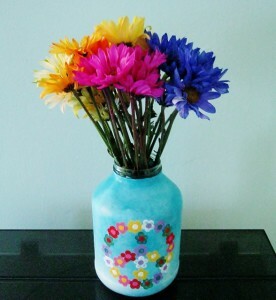 Turn your painted glass jars into special gifts. 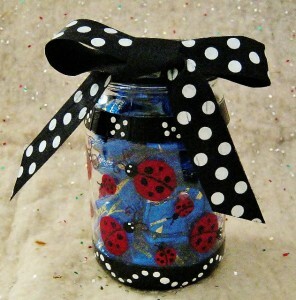 Painted glass jars make nice gifts for any occasion. 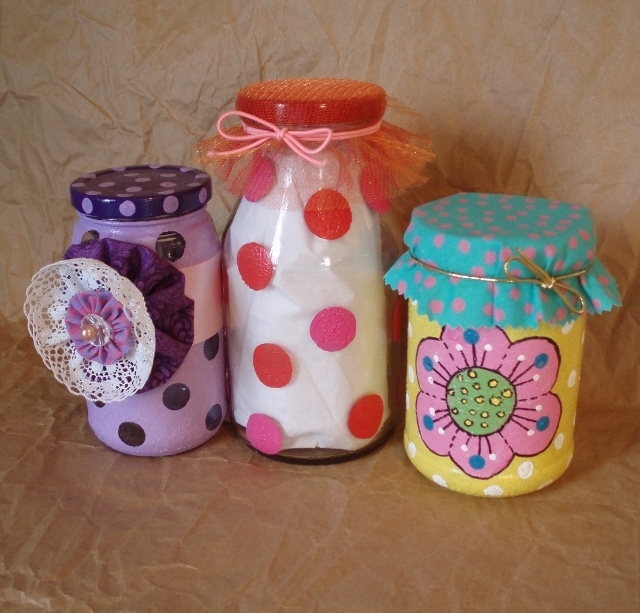 Fill them up with candy, cookies, tea or recipe mixes and add some simple embellishments. 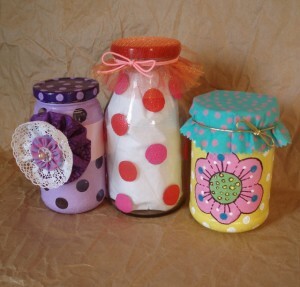 The purple jar is tied with a pink ribbon and a yo yo flower (see my tutorial for making yo yo flowers with a kick). 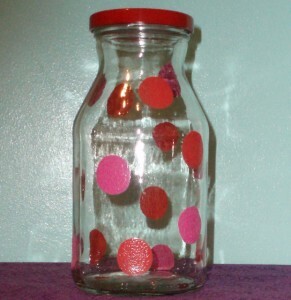 The clear jar with the orange and pink dots is decorated with tulle. 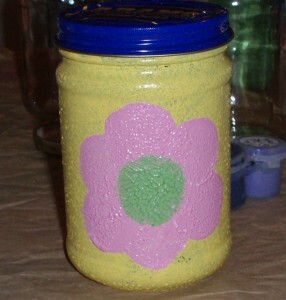 And the yellow jar is decorated with fabric. After you’ve tried these simple glass painting techniques for recycled jars, you might want to try something a little more challenging (like this easy hydrangea painting). You can do that with One Stroke Painting techniques. Pictured below are some nice glass jars that originally held cashews. I painted flower designs on each one, filled them with assorted teas or hot chocolate, and gave them as Christmas gifts. These are the glass jars I painted and made into tea canisters using One Stroke Painting techniques. Sometimes Donna Dewberry’s enamel brushes are hard to find. 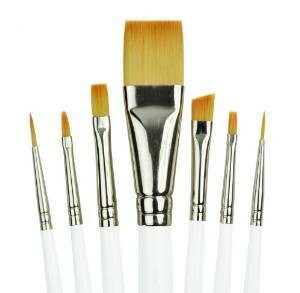 This Royal Gold set of seven brushes looks like a good alternative because they can hold a chiseled edge, yet they are soft. 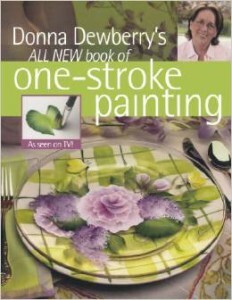 This is an old video of Donna Dewberry on HSN demonstrating One Stroke Painting on glass. The kit in the video is no longer available, but the demonstration is still worth watching. 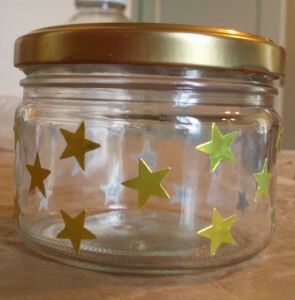 Experiment by creating your own designs on recycled glass jars. You can’t really make a mistake because you can wipe off the paint and start all over. Just have fun and see what you can come up with. 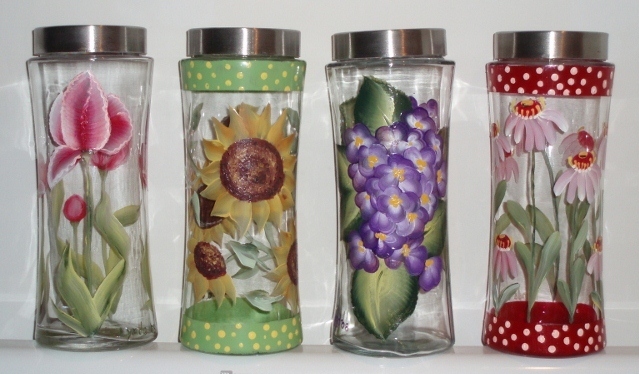 I painted several empty glass soup jars in various designs. The one with the moon was turned into a mason jar lamp. If you want to see how I did it, please read my mason jar lamp tutorial. More glass painting designs. Easy ideas for everyone in these great videos.